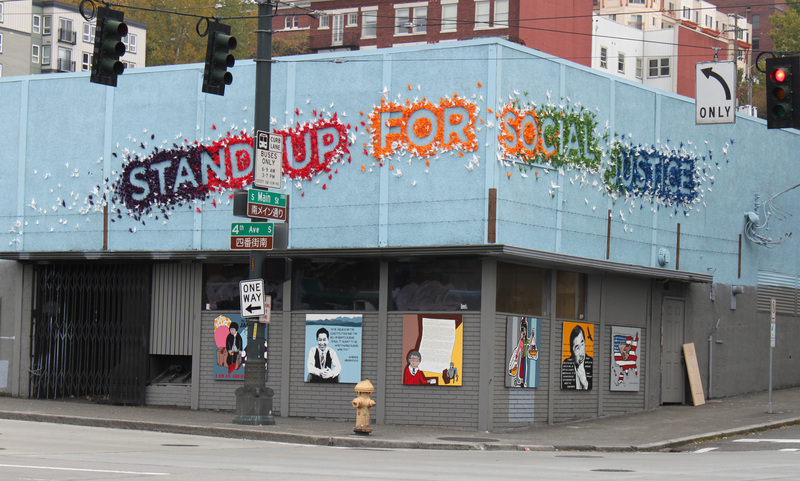 By the late 1960’s, Seattle’s Chinatown was a neighborhood in economic decline. New fire codes, the construction of the I-5 freeway that bisected the neighborhood, and a slumping national economy forced the closure of many hotels and apartment buildings in the area, decimating the residential base of the community. With so many residents displaced, local businesses suffered. In 1969, business leaders and community activists came together to establish the International District Improvement Association, shortened to Inter*Im, to save and revitalize Chinatown. Inter*Im brought local residents and business owners together to identify and address unmet needs in the community. Inter*Im’s early initiatives included helping to start a community health clinic and a Head Start center. And, it brought the community together in another way: by breaking down ethnic barriers and promoting a stronger pan-Asian sense of community identified as the International District. In 1979, in order to play a more proactive role and to secure public and charitable funds, Inter*Im established InterIm Community Development Association (InterIm CDA), as a 501(c) (3) non-profit community development corporation. In 1975, the construction of the King Dome threatened to displace residents and adversely affect small businesses. In response, community leaders, led by Inter*Im, organized and formed a nonprofit organization called International District Housing and Social Services (IDHSS) to preserve affordable housing in the C/ID. IDHSS eventually changed its name to the International District Housing Alliance (IDHA) and over the decades continued to serve as an advocacy voice, community organizing entity, and housing services specialist for the C/ID’s Asian and Pacific Islander (API) and immigrant and refugee community. On January 2, 2012, InterIm CDA and IDHA merged and today the merged organization operates all programs under the name InterIm CDA. InterIm CDA now utilizes a deeper and more strategic approach to community development that strengthens the link between the bricks and mortar of housing development with the human and social capital that make a neighborhood, and a community, vibrant and healthy. Services have evolved to meet new community concerns such as financial literacy, leadership development, environmental justice, and homelessness and the lack of affordable housing. And, because of the merger, InterIm CDA is a more financially sustainable organization that is well positioned to expand our programs and services to more clients and residents in culturally-responsive ways that also helps to build community.